The Ulster was originally a Victorian working daytime overcoat, with a cape and sleeves. It is often seen in period productions of Victorian novels, such as those of Charles Dickens, and was referred to in the Sherlock Holmes stories A Study In Scarlet, The Sign of the Four, "A Scandal in Bohemia", "The Adventure of the Blue Carbuncle" and "The Adventure of the Noble Bachelor". 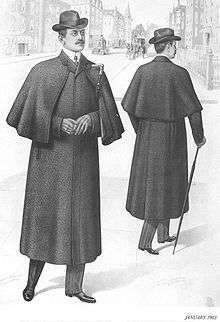 Often made of hard-wearing fabrics, such as herringbones or tweeds, it was not a formal coat at the time, though in the 20th century a cape would be seen as such. After the Edwardian period, it lost its cape, and continued to be used as a heavy-duty overcoat, often in a double-breasted style. A lightweight version of this coat is called an ulsterette. ↑ Lewandowski, Elizabeth J. (2011). The Complete Costume Dictionary. Scarecrow Press. p. 304. ISBN 9780810840041.